Illustration of a nuclear thermal rocket. Such rockets could be a major part of manned missions to other planets in the solar system. A new online petition seeks to send people into space sooner, using a Kennedy-era technology that never had the chance to take flight. At We the People, a website that lets users submit petitions to the Obama Administration, one petition urges officials to "harness the full intellectual and industrial strength of our universities, national laboratories and private enterprise to rapidly develop and deploy a nuclear thermal rocket." 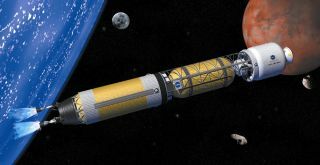 "I wouldn't go so far as to say we couldn't do Mars without nuclear thermal," NASA nuclear engineer Mike Houts said, referring to manned missions. "What it does is it opens up very attractive options for doing those missions." Because of their increased carrying capability, nuclear rockets may ultimately offer a more cost-effective option for a manned Mars mission than chemical rockets do, Houts thinks. NASA currently performs some research, led by Houts, into nuclear thermal rockets. However, in spite of the petition-signers' interest, the project is small. Its budget for hardware and contractors this year is just under $3 million. "It's really in the early stages," Houts told TechNewsDaily. "There are no definite plans to use the engine." Nuclear thermal engines use a nuclear reaction to heat pure hydrogen, ideally to 2,800 degrees Kelvin (4,580 degrees Fahrenheit). This rapidly expands the hydrogen, which shoots out a nozzle to generate thrust. Houts' team, based at the Marshall Space Flight Center in Alabama, is now focused on testing different fuel elements. For this work, they don't need to split uranium and start a nuclear reaction. Instead, they use radio-frequency heating to bring uranium-based fuel elements to sizzling temperatures, then flow hydrogen over the elements. The researchers test coatings and the fuel elements' resiliency to rapid changes in temperature — repeatedly turning the heat turned off and on, which is likely to happen in a real-life rocket. Once they finish this non-nuclear testing, the researchers will move onto tests with a true nuclear reaction, Houts said. Nuclear thermal engines don't pose the same danger of meltdown as nuclear power plants such as Chernobyl or Fukushima, Houts said. The operation of power plants creates fission products that accumulate. During a meltdown, those materials undergo radioactive decay, creating heat. A nuclear propulsion system, on the other hand, doesn't operate at high power before a launch and doesn't accumulate fission products that could cause a meltdown, Houts explained. Nevertheless, he said his team will have to develop a system that won't accidentally turn on when it's not supposed to, which would expose nearby people to high doses of radiation. "That work progressed to a very advanced stage. They'd done 20 full-engine tests on the ground. It really was ready to go into the flight-development stage," Houts said. After 1973, however, the Nixon Administration decided to focus on the space shuttle instead of sending humans to Mars. So research into nuclear thermal rockets was shuttered. "What we're doing right now is using 21st century technologies or 21st century manufacturing materials and going back and recapturing what was done in the '60s and early '70s," Houts said. Should President Obama or a future president decide to use the technology to go to Mars or another planet, "we have a very good, very logical development path" to ready rockets for liftoff, Houts said. He says he's glad people have enough interest in the technology to start a petition. "Any time people are expressing interest in those subjects, personally, I think it's great," he said.